There is an increasing amount of calligraphers London has to offer. We work with some of the best calligraphy artists in London who teach calligraphy classes. Some are self-taught and some are seasoned pro's but all of them are entirely worthy of a mention. Calligraphy was previously a dying art, suffering to stay afloat in a world of printing presses and mass-produced books. However, as with everything, the old became new again and calligraphy has had a make-over. With different calligraphers adding their own twists, modern calligraphy has developed in leap and bounds since the launch of various social media sites, such as Instagram and also the invention of new technology, like the iPad, which now makes it easy for calligraphers to upload their work online and share it with the world. In the modern world, a typeface or a font is crucial to a brand. The style that words are written in can speak a thousand words and it is becoming increasingly popular for all sorts of companies to develop their own signature font. Calligraphers, therefore, recently, have found themselves in a very in-demand position as the art of scrolling letters has seen itself have an uprise. Our calligraphers are not only teachers but they work with brands, they work on private commissions and some of them have even developed their one form of the art and taken to altering the traditional style to reflect their own personal style. If you are looking for someone to create something completely special for your event, wedding or publication then calligraphers are a great place to start. Often they come hand in hand with artistry and always style, they are not only purely talented, but also a delight to work with. We'd recommend any of our calligraphy teachers to our family and friends to help make their events, extra special. Katie is a self-taught calligrapher whose life has completely changed since calligraphy came into it. Katie started off with friends commissions, but eventually, she grew. Working with brands such as Radley, John Lewis, and even the Royal Family. Katie is now teaching large classes regularly and lives and breathes her calligraphy brand, London Calligraphy. 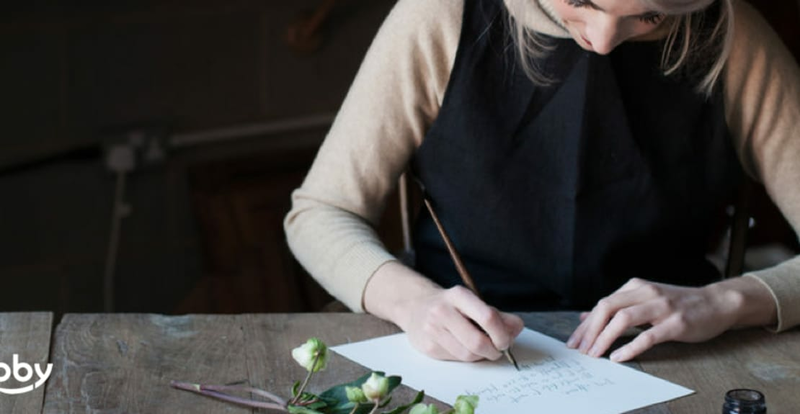 Self-taught mum and calligrapher, London-based Helene takes on small-scale commissions as a side project to her teaching and career as a mother. Helene gathers inspiration for Smitten with Ink from nature and likes to work with neutral colour schemes. Even her classes are taught in a park facing studio with breath-taking views. Working from her studio based in East London, Alice Gabb is a talented modern calligrapher and illustrator. With a passion for creating fancy designs, mixed with a desire to pass on her skills and knowledge to others, Alice offers bespoke designs in everything from wedding place-cards to most recently, Alice designed the window for the Sloan square Jo Malone store and their brand new window display.